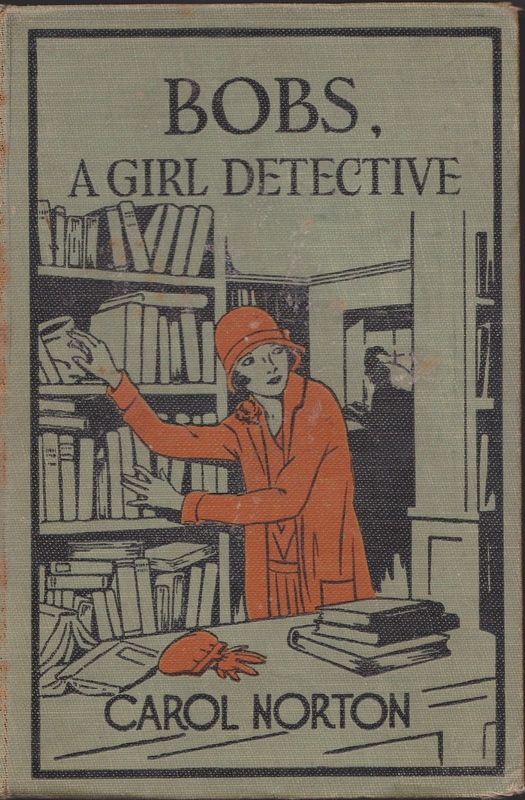 Papergreat: Nifty cover of the 1928 novel "Bobs, A Girl Detective"
"Bobs, A Girl Detective" was published in 1928, two years before the first title in the Nancy Drew series was released. "The 'impoverished' Vandergrift sisters, Gloria, Roberta (Bobs), Gwen, and Lena May have moved to New York City to find work and to live in a dilapidated mansion. They solve mysteries. And help immigrants. And have romantic entanglements. ... The characterization is not deep and the language is often stilted." "At one corner where the traffic held her up, the girl turned and looked at the store nearest, her attention being attracted by a spray of lilacs that stood within among piles of dusty old books. It seemed strange to see that fragrant bit of springtime in a gloomy second-hand shop so far from the country where it might have blossomed. As Bobs gazed into the shop, she was suddenly conscious of a movement within, and then, out of the shadows, she saw forms emerging. An old man with a long flowing beard and the tight black skull cap so often worn by elderly men of the East Side was pushing a wheeled chair in which reclined a frail old woman, evidently his wife. In her face there was an expression of suffering patiently borne which touched the heart of the young girl. "The chair was placed close to the window that the invalid might look out at the street if she wished and watch the panorama passing by. "Instantly Bobs knew the meaning of the lilac, or thought that she did, and, also, she at once decided that she wished to purchase a book, and she groped about in her memory trying to recall a title for which she might inquire. A detective story, of course, that was what she wanted. Since it was to be her chosen profession, she could not read too many of them." Relocated to Nevada from New York City around 1910. Wrote two juvenile-fiction series (Adele Doring, Virginia Davis) from 1919 to 1924 in Santa Barbara, where she married widower W.N. Monfort in 1921. Wrote eight novels from 1926 to 1935 for A.L. Burt. These were later reissued by Saalfield. If you're interested in "Bobs, A Girl Detective" and don't want to track down one of the old books, your other options include Project Gutenberg and LibriVox. Love it. I collect Love Comics.